LAS VEGAS, NV--(Marketwire - Feb 26, 2013) - Fans of high-end slots -- slot machines with bets as much as $5,000 per spin -- will find a new standard of luxury at The Venetian, where the new High-Limit Slots Salon recently opened as part of a complete remodel of the resort casino floor. 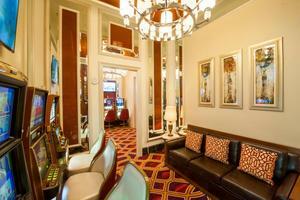 The new salon, which is adjacent to the new Sands Poker Room, offers a high-end experience and service. 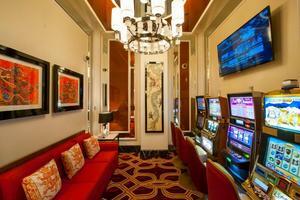 The High-Limit Slots Salon offers a comfortable respite from the excitement of the resort casino floor, along with four parlors, each with four slot machines, a sofa, and a 55-inch LED television screen. The Venetian, and sister property The Palazzo, are known for unique "high-touch" service programs for high-limit gamblers. Both, for instance, feature Paiza, a gaming salon that offers personalized luxury services to the highest level of gamblers who visit the property. 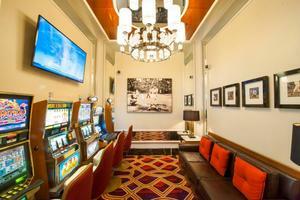 "As a natural extension of this service, our new high-limit slots salon, as well as our remodeled Grazie Gold Club Lounge, aims to provide new luxury experiences," said John Caparella, president and chief operating officer of The Venetian, The Palazzo, and Sands Expo. "We have a team passionate about providing a level of service that can be found nowhere else on The Strip." Also, the new Sands Poker Room recently debuted, offering the largest poker room in Las Vegas, and a new level of comfort and luxury service. Grazie is a loyalty rewards program and an asset to guests who want to make the most of their experience at The Venetian and The Palazzo. Members of Grazie are offered immediate access to exclusive packages and amenities, invitations to select events, offers, and more. Along with gaming credits, members of Grazie can earn points for any expenses charged to their guest suites including dining, show tickets, and retail purchases. For more information on Grazie and upcoming promotions, please call Grazie Services at 702.414.1500 or visit www.venetian.com/Grazie-Loyalty-Program. Earn points when you EAT, SLEEP, SHOP & PLAY with Grazie, The Venetian and The Palazzo's premier loyalty program. Grazie rewards guests for staying in the resorts' suites, dining at the restaurants, shopping at the boutiques, and gaming in the casinos. Guests will enjoy the services and amenities available at two world class resorts with the ease and usability of just one card and one program. Guests playing on qualifying slot and video poker can earn three types of points: Status Points, Slot Reward Points and Grazie Gift Points. Slot Reward Points can be redeemed for a choice of slot credits or resort comps. By linking their Grazie account to their hotel reservation, guests can earn Status Points for all suite charges including: restaurant meals, show tickets, spa services, nightclub drinks, participating shop purchases, suite rates and in-suite charges. Grazie offers three levels of membership: Grazie, Gold and Platinum. A guest's membership level determines the rate at which points are earned and the higher the level, the faster points are earned. For additional information, please call Grazie at 877.2GRAZIE or 702.414.4116. The Venetian Resort-Hotel-Casino, the largest property in the country to receive AAA's Five Diamond and the coveted Forbes Travel Guide Four Star awards, is one of the world's most luxurious resort and convention destinations. Recreating Venice's legendary landmarks, the LEED® EB Gold (Leadership in Energy and Environmental Design)-certified resort offers unmatched service and quality for leisure and corporate guests. With suites ranging from a standard 650-square-foot Luxury Suite to the luxurious 10,000-square-foot Chairman Suite, the all-suite resort boasts more than 4,000 of Las Vegas' most lavish suite accommodations. Located in the heart of the Las Vegas Strip, The Venetian features The Grand Canal Shoppes®, an indoor streetscape complete with gondolas and singing gondoliers, the Canyon Ranch SpaClub®, world-class gaming, exquisite restaurants, a wide variety of entertainment such as "Soul2Soul with Tim McGraw and Faith Hill," the party musical "ROCK OF AGES," showroom headliners including Human Nature, David Spade, Rita Rudner, Tim Allen and Joan Rivers and extensive convention and corporate services. Guests can earn points while they eat, sleep, shop and play with Grazie, the premiere loyalty program. The Venetian and its sister resort, The Palazzo Las Vegas, are the first ever Alliance Resorts in the InterContinental Hotel Group® global portfolio. For additional information, visit venetian.com, follow on Twitter @venetianvegas and interact on Facebook at facebook.com/venetianlasvegas. Statements in this press release, which are not historical facts, are "forward looking" statements that are made pursuant to the Safe Harbor Provisions of the Private Securities Litigation Reform Act of 1995. Forward-looking statements involve a number of risks, uncertainties or other factors beyond the Company's control, which may cause material difference in actual results, performance or other expectations. These factors include, but are not limited to general economic conditions, competition, new ventures, government regulation, legalization of gaming, interest rates, futures terrorist acts, insurance, and other factors detailed in the reports filed by Las Vegas Sands Corp. with the Securities and Exchange Commission.